UNO’s Art Gallery will begin its 2015-16 exhibition season with a combination show with work from renowned, Surrealist artist Sandy Skoglund and members of the Nebraska Art Teacher Association. Opening Friday, August 28, 4:30-6:30 p.m. the exhibit will feature four large photos of Skoglund’s elaborate 3-dimensional room installations. 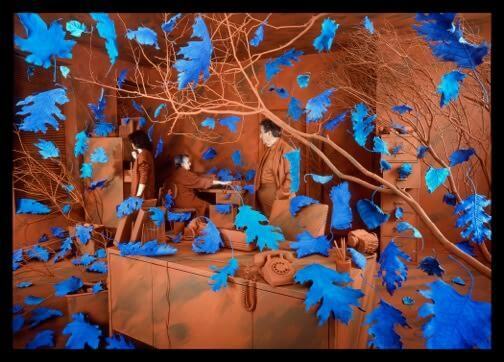 Skoglund’s images (shown: “A Breeze at Work” from 1987) are based on elaborately constructed room sets in limited color made from clay or other materials and photographed with people inhabiting the rooms. The artist fills these monochromatic rooms with multiple props—fish, squirrels, foxes, and sometimes even “radioactive” cats … crafted by the artist. The work is usually presented in photographic form, but museums also commission the artist to construct the full rooms in galleries because of the whimsical humor and expression of fantasy in the original constructions. NATA’s part of this exhibit, which closes Oct. 1, was juried by local sculptor and Creighton Instructor Littleton Alston and hung in conjunction with the art teachers’ Fall Conference. Consisting of a wide variety of media, this exhibit promises to highlight the diverse talent of 31 Nebraska instructors. Juror’s awards for the NATA show will be announced at 3:30 p.m. Sept. 19. In addition to having her work featured at UNO, Skoglund will also give the NATA Conference keynote address at the Joslyn Witherspoon Concert Hall on Friday, Sept. 18 at 10:00 a.m.
UNO’s Weber Fine Arts building is located at the 60th and Dodge Street Campus. Extended gallery hours are 10:00 a.m.-3:00 p.m. Monday through Thursday. Our uniform futureBackbeat – Rock, Women, and Reverb…Oh My!